Combine the confectioners sugar, corn syrup, water, peppermint oil and coconut oil. Sprinkle some confectioner’s sugar on your counter top and knead the dough until smooth. Roll it out between to pieces of parchment paper and place in the refrigerator to firm up. After about 20 minutes, peel off one side of the parchment and sprinkle the dough with some sugar. Repeat on the other side. Cut out one-inch rounds and set aside… preferably back in the fridge to keep them firm. I used a shot glass as a cookie cutter. It was the perfect size. Next melt your chocolate using a double boiler. Take the chocolate off the heat and allow it to cool to 80 degrees and then put it back on the heat until it reaches 88-91 degrees. Cool the chocolate slightly before dipping each peppermint round in. Allow excess chocolate to drip off and then place on a sheet of parchment. Allow them to set in the fridge until the chocolate is firm and then eat them. 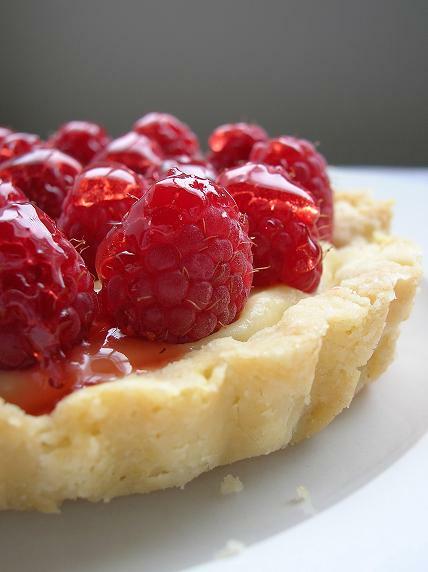 To make the tart dough, place the butter in a large food processor bowl fitted with a metal blade. Process until smooth and creamy, scraping down the sides with a rubber spatula as needed. Add the icing sugar and process until well blended. Add the ground almonds, salt, vanilla and process until smooth, scraping down the sides of the bowl as necessary. Add the flour and pulse the mixture until it just starts to form a ball and stop. Remove the mixture from the food processor bowl and place onto cling film and form into two flat discs. Wrap each disk separately and refrigerate for at least 4 hours, you can freeze the 2nd dough disk to use another time. Once chilled, remove the dough from the refrigerator and roll out between 2 sheets of baking paper until 3mm thick. Carefully place the dough into a 24cm tart tin and press the dough against the bottom and edges of the tin to ensure it is well fitted. If the dough cracks or splits simply patch with additional pastry. Trim the top of the tart – the easiest way to do this is to roll the rolling pin over the top of the tart case which will trim the edges neatly. Refrigerate for at least 30 minutes and repeat with the second portion of dough. Preheat the oven to 180 degrees celsius (350 Fahrenheit) and line the tarts with baking paper and add dried beans or pastry weights and bake for 20 to 25 minutes until lightly colored. To make the filling combine the rhubarb, brown sugar and lemon juice in a saucepan and place over a medium high heat. Bring to a boil and cook until the rhubarb has broken down, between 5 to 10 minutes. Set aside to cool. Preheat the oven to 180 degrees celsius (350 Fahrenheit) and combine the ricotta, caster sugar, egg, vanilla extract and cooled rhubarb in a food processor and process until smooth. Pour the mixture into the tart base and bake for 15 minutes, or until set. Once cooled, top with the sliced strawberries and dust with icing sugar. In a large pot over high heat, bring milk, corn syrup, sugar, and butter to a boil, stirring until sugar has dissolved. Continue to cook over medium-high heat, stirring frequently, until mixture reaches 248oF (120oC), firm-ball stage on a candy thermometer, about 20 minutes. Remove from heat and stir in vanilla and salt. Pour into prepared pan, and allow to cool. In a large bowl, cream together butter and sugar with a mixer or a sturdy fork until light and fluffy. Slowly add dry ingredients to the butter mixture. Mix the milk and vanilla into the dough, using a low speed on the mixer, or the fork. Separate the dough into two halves and wrap each half tightly in plastic. Refrigerate until the dough is firm. While the dough is refrigerating, preheat your oven to 350F (180C). Toast the shredded coconut on a baking sheet for about 10-15 minutes, stirring frequently. Let cool while shaping and baking cookies. Line two baking sheets with silicone liners or parchment sheets. Once the dough is firm, roll it out on lightly floured surface to a thickness of 3/8-inch to ¼-inch thick. Cut out with biscuit cutter or two differently sized round cutters. Bake cookies one sheet at a time for 10-12 minutes, rotating the cookie sheet 180°, halfway through baking. Set cookie trays on cooling racks and allow to cool for about 6 minutes before taking cookies off of the trays. Transfer cookies to the cooling rack. Allow cookie sheets to cool completely before putting new cookies to be baked on them, placing raw dough on hot sheets melts the butter and makes the cookies spread. Place caramel, milk and salt in a microwaveable bowl and microwave on high power for 1 minute at a time, stirring after each minute, until nice and melty (3-4 minutes). Stir the toasted coconut into the caramel. 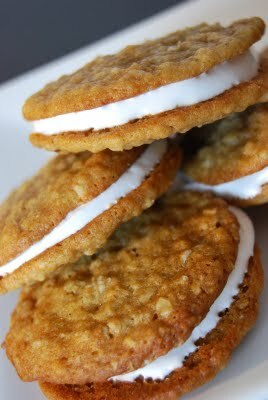 Using a knife or an offset spatula generously spread the caramel mixture on top of your completely cooled cookies. 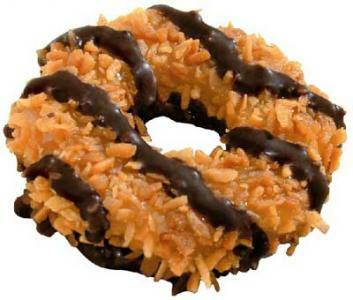 You may reheat the caramel mixture as needed if it becomes too hard to work with. Lay sheet of waxed paper on the counter. Roughly chop the chocolate and microwave on high power in 30-second bursts, stirring between each, until melted. 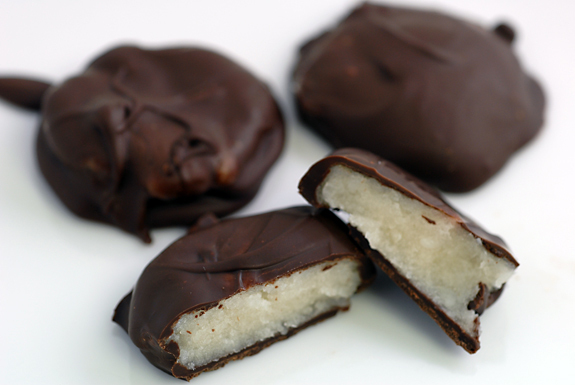 Dip the bottoms of your coconut-topped cookies into the chocolate and place on waxed paper to cool. Once all the cookies have been chocolate dipped, place the rest of the chocolate in a small ziptop bag. Cut a small hole in one corner of the bag, and pipe the chocolate on top of each cookie. over medium heat combine milk, salt and vanilla bean seeds. Whisk constantly until the milk is steaming, and just about ready to simmer. Remove pastry cream from heat, strain through a fine mesh sieve into a clean bowl. Whisk in butter. Place bowl in ice bath and whisk to cool the pastry cream quickly. Place a sheet of plastic wrap directly on top of cream, cover bowl with another sheet and refrigerate until well-chilled. 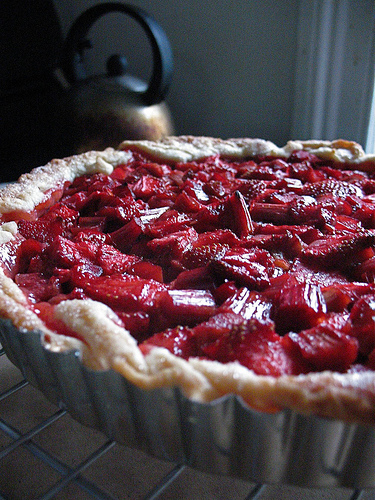 DO AHEAD: Pastry cream may be made up to five days in advance. Place oven rack on the center level, preheat to 375°F. Line a half-sheet pan and a smaller baking sheet (basically, whatever pan arrangement that you can fit on one rack in the oven so you don’t need to rotate pans during baking) with a silicone baking mat or parchment paper; set aside. In a small bowl, whisk together millet flour through xanthan gum. In a medium-sized saucepan over medium-high heat, combine water, milk and butter. Warm, whisking constantly, until butter melts and mixture comes to a simmer; stir in sugar and salt. While pan is still on the heat, stir the flour mixture into hot water mixture stir with a wooden spoon until it forms a smooth, stiff paste (about 1 minute). Remove from heat and scrape the dough into the bowl of a stand mixer. Break two of the eggs into the paste, beat on medium-high speed until it’s smooth and kind of sticky looking (takes a couple minutes). Break the remaining eggs, one at a time, into the paste, and beat again after each addition until blended (it will easily pull away from the paddle). Beat in vanilla extract. Spoon small, level cookie scoops (1 tablespoon) of paste onto prepared pans spaced about 1 1/2 inches apart. Place pans in oven and bake at 375°F for 25 minutes, then reduce heat to 325°F and bake another 5 minutes or until nicely browned and somewhat dry on the inside. Remove from oven and transfer puffs to wire cooling racks. Once cooled completely, proceed to filling. Fit a 12” pastry bag with a Wilton #230 pastry trip (no coupler required). Fill with a third of the cold pastry cream. Puncture the side of an eclair with the pastry tip, fill with cream (just until it feels like the shell is going to burst) and wipe off excess from around the filling hole. Place filled eclairs on a plate and refrigerate once the first pastry bag of cream runs out. Refill pastry bag and repeat filling/refrigerating process. In a small saucepan, warm cream over medium-low heat, stirring occasionally, just until you see a bubble come to the surface. While cream is heating up, place chocolate through salt in a heatproof bowl. Pour hot cream over chocolate and let it sit for a minute; gently stir until the chocolate is melted and the mixture is smooth. Dip the tops of the filled eclair bites in the ganache, allow excess to drip back into the bowl. Place glazed bites on a clean platter. Allow chocolate to set at room temperature for about 15 minutes before serving or refrigerating. 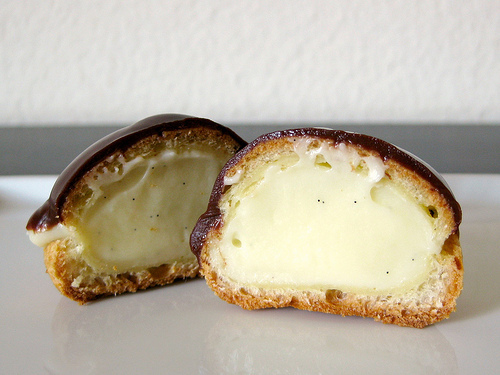 Eclairs are best eaten within several hours of filling. Preheat oven to 350 degrees. Cover baking sheets with parchment paper, set aside. In the bowl of a stand mixer cream together the butter, brown sugar, and sugar until light and fluffy. Add eggs, honey and vanilla and beat until incorporated. In a separate medium sized bowl whisk together flour, baking soda, cinnamon, and salt. Slowly add the flour mixture into the butter mixture and mix just until incorporated. Stir in oats until evenly distributed. Transfer dough to a large mixing bowl (this is so you can use stand mixer bowl for the frosting) and chill in refrigerator for 15 minutes. Remove dough from refrigerator and drop by tablespoons onto baking sheet (or even a bit smaller for smaller cookies). Bake for 8 to 10 minutes just until the edges start to brown. Cookies will seem moist in the middle but they will set up. Cool on baking sheet until set and then transfer to a cooling rack to cool completely. Once cool, on the underside of one cookie spread the marshmallow frosting and top with another cookie. Store in an airtight container. In a double boiler, add egg whites, sugar and cream of tartar and heat over simmering water. Whisking frequently, heat until egg whites become very frothy and sugar is dissolved (approx. 160 degrees). Carefully add egg mixture to the bowl of a stand mixer fitted with the whisk attachment. Whisk on high speed for several minutes until egg mixture will hold stiff peaks and is light in texture. Carefully fold in vanilla until incorporated. Add frosting to cookie and then top with another cookie.